I learned how to make pineapple cheesecake recipes early in my adult life. It was actually the first cheesecake I made and I topped it with a pineapple sauce. It was a simple small pie size one which was so delicious and became my husband’s favorite dessert. He never ate desserts when I married him. After one bite of this one, he took a fork and ate the entire pie. The combination of this sweet cheese dessert with pineapple is such a delicious flavor. I was a child when I first tasted pineapple. A local man in our town started what eventually became a large state of the art supermarket. Woody was definitely a man before his time. Once a year he would fly in a large shipment of fresh pineapples from Hawaii; also several Hawaiian girls to do hula dancing for all the customers. At this time samples of this delicious fresh fruit was given out. I also sampled what I now think was something like pineapple cheesecake recipes (I now think it may have been a ricotta cheesecake. 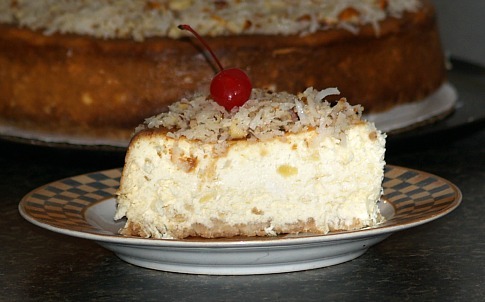 I loved this flavor and tried hard to learn how to make pineapple cheesecake recipes. This just happened at my very first try at cheesecake recipes. I always thought it would be nice to live in Hawaii where I could grow my own pineapples to make my pineapple cheesecake recipes and any other recipe. Years later after I moved to Florida, I was in a discussion about this same fruit. My friend said “You know how to grow pineapples? They grow well here in Florida”. I could not believe that! All you have to do is cut the tops of, plant in the ground and water them. I knew how to grow a garden in Florida; I had citrus trees and strawberries. But pineapples! I found that growing pineapples is that easy. They grow like weeds! After a few months I had about 12 pineapples growing very well. A friend brought over five more for me to plant. That afternoon I went out to place them in the ground with the others that were already growing. My two mastiffs, Enoch and Malachi went with me. They were so good and laid there quietly to watch. When I finished my dogs followed me back up to the house and I never thought any more about it. Well that night my “little trouble makers” returned to the scene. They dug up every pineapple and ate the bottoms; they love pineapple too. So much for growing pineapples for my desire to make pineapple cheesecake recipes; I buy them now. Another interesting point about the pineapple is that it has been a universal symbol of hospitality and welcome for many centuries all over the world. During early Colonial days in the United States, people in the colonies would set a fresh pineapple in the center of the table as a colorful centerpiece of the festive meal, especially when visitors joined them in celebration. On one of my trips I visited Old Williamsburg, Virginia. It was delightful to see the appreciation there shared for this wonderful fruit. There, it is not just pineapple cheesecake recipes and other desserts that are so loved but also recipes for many entrée dishes. Combine flour, ¼ cup sugar and 1 teaspoon grated lemon peel; blend well. Cut in butter until crumbly; add 1 egg yolk and ¼ teaspoon vanilla. Stir mixture with fork until dry ingredients are moistened. Press mixture on bottom and 1 inch up sides of 10 inch spring form pan. Bake 8 minutes or until crust is golden; cool. Reduce oven to 325F degrees. Beat cream cheese on medium speed until creamy; gradually beat in 1 ¾ cups sugar. Add eggs and egg yolks one at a time beating well after each addition. Combine 3 tablespoons flour, ¾ teaspoon lemon rind and salt. Add to cream cheese mixture and beat until smooth. Stir into mixture the whipping cream and ¼ teaspoon vanilla; pour mixture into prepared crust. Bake at 325F degrees for 55 minutes or until cheesecake is almost set. Turn oven off, partially open oven door and leave cake in oven for another 30 minutes. Remove from oven and cool in pan on rack to room temperature. Arrange strawberry halves on top of pineapple cheesecake recipe; place pineapple halves around strawberries. Make strawberry glaze (below) and pour over cake; cover and chill 8 hours. Combine mashed berries and water in saucepan over medium heat. Bring to boil, reduce heat and simmer 2 minutes. Pour mixture through a wire strainer into bowl; discard seeds and pulp. Return liquid to saucepan; combine sugar and cornstarch and stir into hot mixture. Cook and stir for 1 minute; cool completely. Combine and blend crumbs, ¼ cup sugar and butter. Press mixture in bottom and 1 inch up sides of 10 inch spring form pan. Beat cream cheese on medium speed in a large bowl until creamy. Gradually add ¾ cup sugar and beat well. Stir in pineapple, cream of coconut, sour cream, cornstarch, vanilla, rum and lemon juice. Spoon mixture into cooled crust. Bake for 1 hour and 20 minutes; turn oven off. Mix topping (below) and sprinkle over cheesecake; return to oven. Leave in oven (Door closed) for 1 hour; remove from oven and cool to room temperature. Melt butter in saucepan; add remaining ingredients and cook until coconut and almonds are golden stirring often. NOTE: I garnished with coconut, pineapple chunks and Marschino cherries. 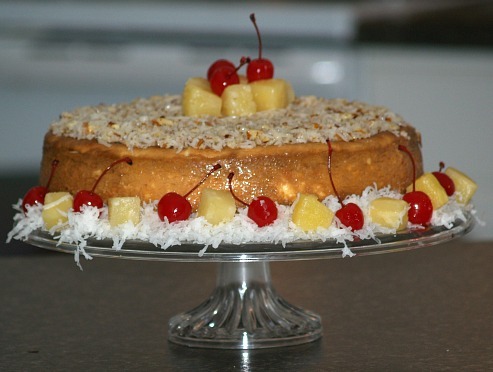 Serve this pineapple cheesecake recipe while still frozen; it makes a great summer dessert. Combine in bowl milk and whipped topping; gently fold in pineapple, nuts, cherries and lemon juice. Divide equally into two graham cracker crusts; freeze about 4 hours until firm. Remove the pineapple cheesecake recipe from freezer about 20 minutes before serving; garnish with mint, nuts and cherries. TO MAKE CRUST combine crumbs and butter. Press mixture (Reserving 1 cup) in bottom of 9 inch spring form pan; set aside. Dump pineapple and juice in saucepan; bring to a boil. Set pineapple off heat; stir in lemon gelatin until dissolved. Pour gelatin in bowl; chill gelatin mixture until it begins to gel. In small clean mixing bowl beat canned milk until stiff; set aside. In a large mixing bowl beat cream cheese and sugar together until smooth. Add the beaten milk to the cream cheese mixture; stir together until well blended. Add the gelatin mixture; stir until well blended; spoon into prepared crust. Top with 1 cup reserved crumb mixture; refrigerate several hours until firm. NOTE: 1 Can pineapple and syrup is for filling and topping. TO MAKE CRUST combine cookie crumbs and butter. Press on bottom and up sides of 9 inch spring form pan. Bake for 8 minutes; chill. TO MAKE FILLING mix in a saucepan gelatin, ½ CUP sugar. nutmeg, salt, yolks and reserved syrup. Let mixture stand 1 minute; stir over low heat until gelatin is dissolved about 5 minutes. Add the lemon juice, vanilla and lemon peel stirring to blend; beat in the cream cheese. Chill stirring occasionally until mixture mounds when dropped from spoon. Beat egg whites until stiff peaks form; fold whites into the cream cheese mixture. Pour mixture into crust; chill until firm. TO MAKE TOPPING mix ¼ cup of reserved syrup with water in saucepan; heat to boiling. Mix 1 teaspoon gelatin with 1 Tablespoon sugar; add the hot liquid stirring until gelatin dissolves. Add the drained pineapple to the mixture; chill stirring occasionally until consistency of egg whites. Spoon over top of cheesecake and chill until firm; 12 servings. TO MAKE CRUST combine and mix crust ingredients. Refrigerate the crust until ready to fill. TO MAKE FILLING combine pineapple soft cream cheese, rum, extract and eggs in large bowl. Beat mixture on medium speed until well blended. Blend in the pudding mix, sour cream and pina colada mix. Pour cheese mixture into prepared cheesecake crust. Place in oven and bake for 40 to 50 minutes until center is slightly set. Cool on rack; refrigerate until cold at least 2 hours. TO MAKE TOPPING beat cream cheese and sugar in large bowl until smooth. Fold in the whipped topping; pipe to decorate or spread over the cheesecake filling. Sprinkle top with the toasted coconut; refrigerate for 2 more hours. Before serving remove sides of pan; store in refrigerate. Makes 10 to 12 servings (Depending on serving size).